It’s almost the end of June and I haven’t written about juneberries, my favorite foraging fruit next to blackcaps. 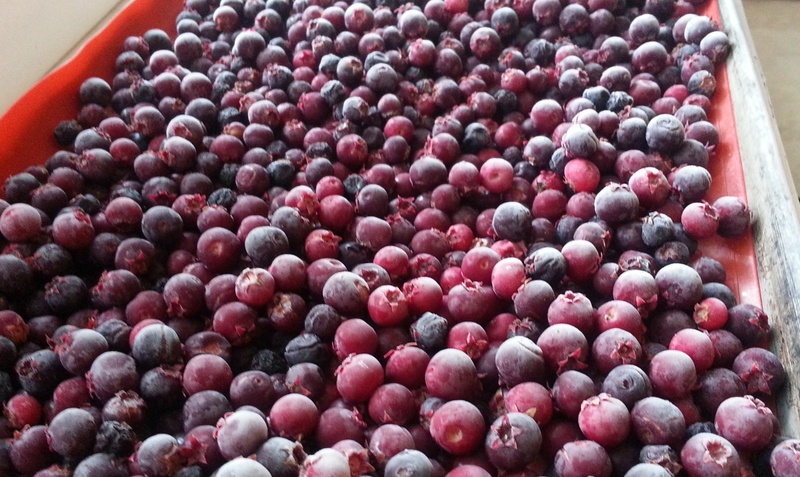 Juneberries are small, round berries that look like tiny purple crabapples, but that are soft like a blueberry. They grow on shrubs or small trees. Where I live they are often called serviceberries or amelanchier (after their Latin genus name Amelanchier), probably because they don’t really coming into full productivity most years until the beginning of July — unlike further south, where June is their peak season. Further north, they’re known as saskatoons. I’ve also heard them called wild pears, shadberries, and sugar plums. That last name is very fitting, as juneberries are sweet as can be. 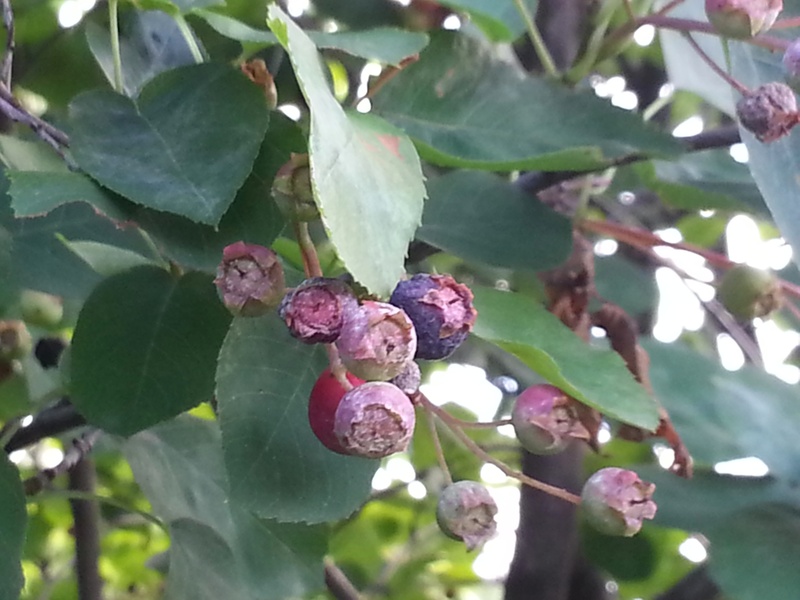 I first discovered juneberries ten years ago when attending a village board meeting and noticing a fruit-laden tree outside the village hall’s entrance. I examined the leaves, bark and shape of the fruit, and was 99% sure that it was a member of the rose family and therefore edible. I rubbed the fruit on my lips and waited for a bad reaction. None occurred. Then I tasted the fruit — and delighted far beyond expectations. It had a rich, complex flavor reminiscent of sweet cherries, apples, blueberry, and a hint of almond. Since I still didn’t know what the fruit was, I spit it out instead of swallowing, but I biked happily home, eager to look in my plant guides to find out more about this wonderful discovery — and hopefully confirm its edibility. The guidebooks confirmed my suspicion that juneberries were edible. I went back to the village hall and asked if anyone minded if I picked some. No one did. So I indulged. It was late in the juneberry season, so many of the fruits had turned dark purple and started to shrivel up like raisins. The semi-dried ones were even more delicious than the plump ones, and made a great addition to salads and oatmeal. Every year since, I have kept my eyes open in late June and early July for ripening serviceberries. They start out green, then turn white, light pink, and dark pink before blooming into a deep purple that shows they’re completely ripe. They are sweetest when they are dark like blueberries, although slightly underripe, purplish pink berries are also very tasty and can be enjoyed by the handful. Juneberries are very popular as a landscape tree in many urban settings, putting on a spring flower show that rivals those of crabapples. Unfortunately (or fortunately for those of us who enjoy foraging), not many people realize that they are edible and more delicious than most of the fruits you can buy in a store. Like many berries, however, juneberries don’t make for the quickest picking. Earlier this week I did my first harvest, and it took me about an hour to fill a quart container. Listening to language lessons while picking helped keep me from getting too antsy. Yesterday, I went back to the same tree with Dekalb and two ladders, and things went more quickly — we got about a gallon and a half in as many hours. Only two people stopped to ask what we were picking. They had a taste and said the berries would make a great pie. That’s undoubtedly true, but I just freeze them on silicon-covered baking sheets and then bag them, using them like blueberries or raisins in baking, cereal and yogurt throughout the year. They’re also excellent in Scandinavian-style fruit soups. Here’s a dessert recipe I adapted from the traditional Swedish blåbärssoppa and Finnish mustikkakeitto (huckleberry soup). Bring water, berries and cinnamon stick to a boil, then simmer rapidly until berries pop and get mushy, about 15 minutes. Alternatively, heat on high in a slow cooker for a few hours until they reach this texture. Remove from heat. I you prefer a smoother texture, remove the cinnamon stick and puree the soup in a blender, or pour it through a sieve to strain out the skin and seeds. Add sweetener and lemon juice. Remove a bit of the liquid to mix with the potato starch. When the starch mixture is smooth, pour it into the soup. Return to low heat and whisk until thick, about 3-5 minutes. Serve hot or cold. Good garnishes include whipped cream, yogurt, or crumbled gingersnaps. We don't have June berries in Texas but sure do remember them growing up in MN. Let me know if you need me to send you some juneberry jam!